2. I`ve struggled to find enough strong anchor points for the box. Some may know that NN does an `adaptor kit` for a TT tool box - the kit is actually made by meeee but I`ve never been happy with `just` the two anchor points which the adaptor kit hangs off (so I never did anything about it coz it was for a TT product ). I`ve finally got my act together and come up with a fixing kit that uses 4 existing M8 anchor points (so there`s no drilling) two which are located on the sub frame under the pillion plate (you can see where the brackets are bent to pass through the slits where the pannier hooks would normally go - cunning as a fox, me) and two which are located at the LH passenger footrest hanger positions. It fits the new R1250 and the outgoing R1200 GS LC. You can`t fit the LH pannier too so it`s either one or the other. 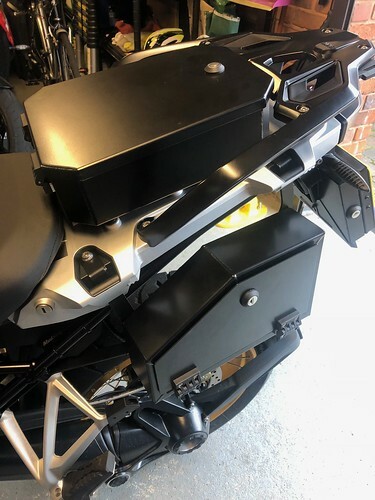 Also shown is the pillion utility box and the number plate utility box all fitted to my new R1250GS. Re 1) Surely not ! Looks like an excellent product, like the gsa one I purchased from you. Highly recommended, as a happy customer and tightfisted Scotsman.